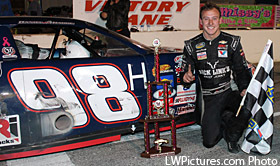 For the second week in-a-row, Daniel Hemric made yet another late race surge to win the Pro All Stars Series (PASS) South Super Late Model event Saturday night at Dillon Motor Speedway. Hemric passed Cole Timm with two laps to go when Timm tangled with the slower car of Will Gallaher and survived a green-white–checker finish for the win in the 9th Annual South Carolina Clash. In qualifying, Wallkill, NY rookie Tyler Dippel had the quick time with a lap of 91.076 miles per hour around the egg-shaped 4/10 mile speedway. After the top 10 qualifiers redraw, Spencer Wauters and Tate Fogleman moved to the front while the two fastest qualifiers, Dippel and Preston Peltier, slid back to ninth and tenth in the order. Fogleman took the lead at the drop of the green flag, but was overtaken on the second lap of the race by Gus Dean. The first caution of the race would wave on lap 3 when Gallaher bobbled exiting turn four causing Brandon Setzer, Bill Catania, and Hayes Goodson all to spin and make hard contact with the inside wall. Just two laps later, Fogleman slammed the wall exiting turn four resulting in a multi-car melee on the front stretch. The car of Jody Measamer was sent tumbling upside down before ending up back on all four wheels. While several cars were able to stop to avoid the accident, the machines of Garrett Campbell and Matt Daley suffered heavy damage and were unable to continue. Despite the severity of the incident, all the drivers were able to escape without serious injury. Following a red flag to clean up the accident, Dean continued to lead over Wauters and Joe Heigl. Behind the lead trio, contenders began to maneuver into position for the final stretch run to the checkers. On lap 111, Lee Hansard and Tanner Rumburg spun in turn three allowing the lead lap cars to close back together once again. Timm looked to have the fastest car on the track in the late stages moving around Peltier and Wauters into second. Despite leading nearly 140 laps, Dean’s car was beginning to fade. Timm moved by Dean to take the lead with 12 laps to go, while Hemric started to mount his final push to the front. With Hemric closing, Timm lost ground behind the lapped car of Gallaher. Hemric made the move to draw alongside Timm with two laps entering turn one, with Timm eventually spinning Gallaher’s slower car exiting turn two to bring out the final caution of the night. Hemric held Timm off on the final restart to take his second straight win at Dillon Motor Speedway and 4th career PASS South Super Late Model triumph. Tyler Church finished third in front of Peltier and Wauters, who incidentally finished fifth for the third time in the last six South Carolina Clash events. Rounding out the top ten were Dean, who led 137 laps on the night, Jimmy Doyle, Heigl, Jared Irvan, and John Batten. Zachary Dabbs survived an equally wild race for his first career PASS Pro Late Model win. Fellow rookie Jacob Schneider appeared to be on his way to victory after making a three wide move to take the lead around Jeff Batten and Dabbs on lap 19. But, contact with Batten with 10 laps to go sent Schneider into the turn one wall. With both Schneider and Batten out of the race, Dabbs held off Greg Bohannon, Jr. for the victory. Rounding out the top five were Matt Murphy, Schneider and Lucas Jones. Michael Tucker led the most laps en route to the win in the 4 Cylinder Mayhem main event. The PASS South Super Late Models and PASS Pro Late Models will be in action once again next up on Saturday night April 5 at Orange County Speedway for the 9th Annual Orange Blossom Special. Legends cars will also be in competition. Entry forms and the weekend schedule will be posted soon at ProAllStarsSeries.com. Daniel Hemric has two PASS wins this season.